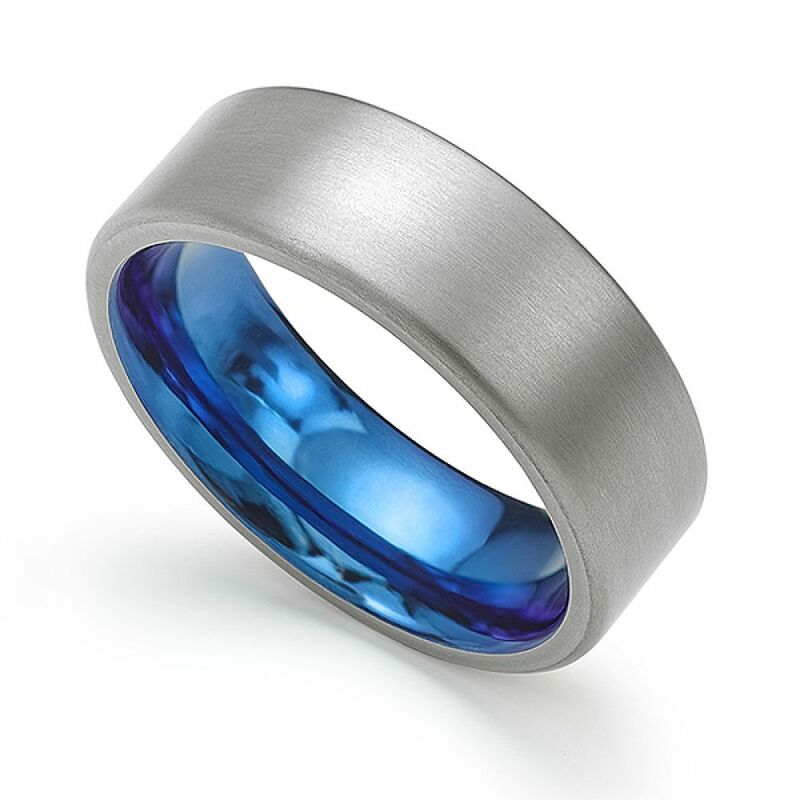 A flash of blue hides within the Denim Blue wedding ring – crafted in Zirconium with a brushed finish. An unusual wedding ring with a comfort fit, 7mm width and flat court profile. Something blue – hidden within a modern classic Wedding Ring. A flash of intense Denim blue contrasts with gun-metal grey in this uber-modern Wedding Band. Crafted in a choice range of widths, this distinctive ring features a modern flat-court profile machined from durable Zirconium. Contrast is not only a result of colour, but also texture – the inner blue mirror polish against the outer brushed satin finish. This exceptional Wedding Ring offers value in a substantial yet light-weight design machined in industrial–jewellery grade Zirconium. Zirconium was discovered in 1789. Pure Zirconium metal was not produced until 1824. A soft silver-grey substance, Zirconium resides in small quantities within the Earth's crust. It has been used in Nuclear reactors, spacecraft and jet engines – prized for its heat resistance and light-weight properties. 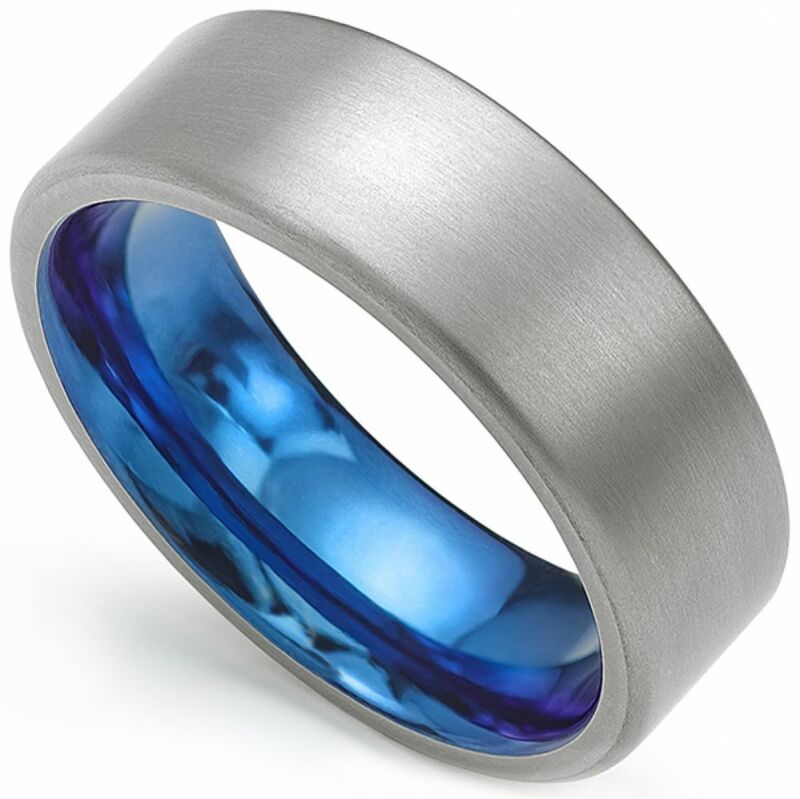 The blue surface of our Denim Blue wedding ring is created by anodising the inner surface of the wedding ring, a technique that can be applied to surfaces that are not subject to wear. Please allow approx. 3 weeks for the Denim wedding ring to be made. Please enquire about alternative colours and specifications. Denim Blue - Denim-Blue. Denim Blue Zirconium Wedding Ring. Service rating : An amazing piece of art, exactly what I wanted. Customer service is great, with a really nice experience visiting the Isle of Wight and the booked appointment to discuss the details and get the perfect size. Service rating : Excellent, and very quick service. Very willing to answer questions quickly. Item was exactly what we wanted. Product : Exactly what I was after.